The adage apparently is that any publicity is good publicity. And in making Colin Kaepernick the face of their latest campaign, sports giant Nike are certainly testing that. For those who haven’t caught up on what the fuss is about, Kaepernick (pronounced Capper-nick) is the former quarterback for the NFL’s San Francisco 49ers who started kneeling during the playing of the American national anthem before games as a form of protest against various social issues and injustices, starting with the shootings of several unarmed blacks by law enforcement. Kaepernick himself is biracial, born to a teenaged white mother and raised by adoptive parents. Although he’s been joined by many other athletes across multiple sports, Kaepernick – who led the Niners to the NFC Championship game in 2011 and 2013 and the SuperBowl in 2012 – remains the lightning rod for the debate whether this form of protest is legitimate, or a deep affront to the American way of life; one that goes all the way to and includes the current occupant of the Oval Office. No Western country – since we can’t say for sure about some other places on the globe like Iran or North Korea – intertwines patriotism with sport to anywhere near the same extent as the USA does. After all, this is a country that has stealth bombers overfly big events and where the military pays leagues to use them for promotional purposes, and inevitably the lines get blurred. Kaepernick’s appearance was always going to be divisive, and if you look at the #BoycottNike hashtag you’ll find that conservative America has lost its mind. There’s a certain rich irony in seeing people who have spent the past two years deriding others as “snowflakes” hacking the famous swoosh out of clothes or burning them (and in one case seen so far with shoes even while still wearing them! ), seemingly all because of who the person in the picture is. It’s all the more remarkable since Nike are the official suppliers to the NFL, recently signing a US$3billion extension to the previous deal. The timing of the campaign release is also interesting. The NFL season kicks off this week with the first game on Friday (NZ Time), Kaepernick’s own lawsuit against the NFL has just been given permission to proceed through the courts. In that Kaepernick, who hasn’t played in the NFL since opting out of his contract with the 49ers in 2017, alleges that the NFL owners – a group of 31 extremely wealthy and predominantly white men (plus the unique ownership status of the Green Bay Packers) – have colluded to not offer him a contract because of his stance on social issues rather than his football abilities. He’s been joined in that lawsuit by his former teammate Eric Reid who knelt alongside him, and has found similar difficulties in finding an NFL job this offseason. 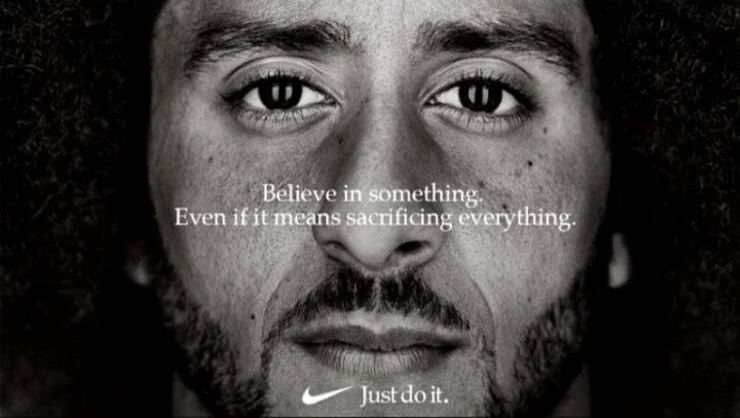 If there is one company though that could afford to take this sort of stance it is Nike, even if the first day since the unveiling saw Nike’s sharemarket value drop by 3.2%. It’ll be an interesting watch to see if they stay the course or it fades from the public view. Previous story An On-line Sports-based Daily? Let’s do it.